You'll be £19.99 closer to your next £10.00 credit when you purchase Alone I Fly. What's this? After several years at sea, Sgt Bill Bailey arrived in Cairo in 1942 as a new recruit to the RAF, hoping to fulfill his ambition to fly bombers. 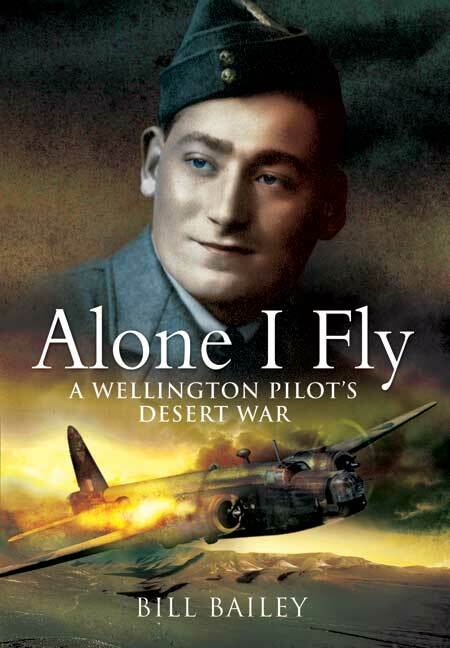 Within hours of his arrival he is sent on his first bombing mission as second pilot in a 104 Squadron Wellington. The aircraft was hit by enemy gunfire and suffered continual loss of altitude as it struggled to return to base. In thick cloud over a vast expanse of barren desert the aircraft hit a rock outcrop and disintegrated. Bill came too lying alone on a precipitous ledge and soon realized that he was the sole survivor. If he was to live he had to find help. To walk in temperatures of over 100 degrees proved impossible, so he trudged over seemingly endless dunes at dusk and dawn, his energy gradually fading. On the point of near collapse he found what he thought was a small cave in which to shelter from the searing sun. His luck now changed as he realized that his shelter was in fact an abandoned German reconnaissance truck. He found water and a little food, but no radio. He gradually resigned himself to death as he was incapable of moving any further, but then with a last desperate inspiration he realized that it may be possible to attract attention by heliograph. He found enough equipment in the truck and rigged a mast with the mirror at the top and commenced signaling and was eventually rescued by a Long Range Desert Patrol. After recuperation he rejoined his squadron and was given a new crew with whom he completed his tour. He was then sent to Malta where much to his amazement he was made ground controller of a satellite fighter airfield. He eventually was repatriated to the UK suffering with Malaria. Bill Bailey started this memoir many years ago, mainly for his grandchildren. Having completed it only two years ago he succumbed to a long illness and died in 2007. He also wrote Weather for Kids and an audio package entitled Science through Story.